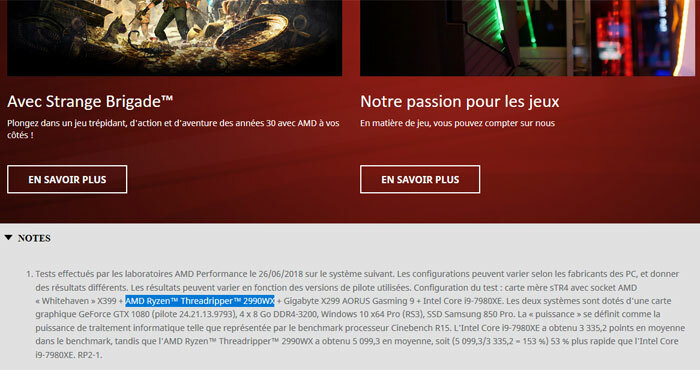 Over the weekend AMD France prematurely published benchmark scores for an as yet unreleased second gen Ryzen Threadripper CPU. A Guru3D forum user shared the information concerning the Ryzen Threadripper 2990WX. This 32C/64T processor and its Cinebench benchmark score was listed on the footnotes of a page since taken down. Thanks to the Google Web Cache you can still see the footnotes here though. Above AMD pitted its new 32C/64T CPU against Intel's current enthusiast flagship, the Core i9-7980XE, which packs 18C/36T. AMD's processor is approximately 50 per cent faster in this rendering benchmark. According to a leak published by VideoCardz just ahead of the weekend, the upcoming Threadripper 2990WX will cost $US1799 at launch. This compares very nicely with the Intel chip in the benchmark comparison above, which has an MSRP of a dollar or two under US$2000. In this leak story we are told that a 'WX' suffix means that the processor has been designed for "creators and innovators". Meanwhile 'X' suffixed processors are for gamers. As well as leaking the intended pricing of the Threadripper 2990WX, VideoCardz shared that its base clock would be 3.0GHz with a boost to 4.2GHz, and that it has a 250W TDP. It will be joined by three other second gen Threadrippers; the 2970WX with 24C/48T costing $1299, the Threadripper 2950X with 16C/32T costing $899, and the Threadripper 2920X with 12C/24T costing $649. Those last two are 160W parts. Considering the 8180 (appears to be at stock) got 4355 on Cinebench r15 multicore and I'd be very surprised if they didn't hit their core to die limit. For the TR2 32 core to get 5099 is very good. The 8180 delivered 155 points per core whereas the Tr2 32 core delivered 159 points per core. Which is pretty nifty. This means that stock for stock the Tr2 32 core performed 17% better and costs nearly 80% less than the 8180. Price vs price though, the Tr2 32 core performs 47% better at a similar price bracket as the i9-7980XE (5099/3455) but it did produce 191 points per core. This means that Intel will have to have an around 24-26 core processor performing at 2.6GHz with 4.2GHz boost to match the Tr2 32 core. This is possible, Intel could pull out all the stops. However price wise i think the richness of value and compute power will rock the top end range of CPU lineups. After years of hardly any real progress from Intel and constantly taking the smeg out of consumers with apparently pointless socket changes, confusing product lines, etc I'm quite happy to see them get crushed. By constantly holding back on R&D because they were so dominant in the marketplace they're now not in a position to respond properly. We saw their hasty response to Ryzen - if they'd been doing things properly they'd have had a well tested platform ready to deploy knowing they could hold back if Ryzen flopped. But they had to rush out some answer and it was a mess. Now they're having to do what they should have been doing all along which is to compete and innovate. Really, all I'm seeing is them using marketing tricks to make it look like there's progress when it's really quite limited. In a sense they seem to be doing what AMD had to do all those years ago when they were behind on IPC - throw more cores at the problem. Intel made this bed, now they can lay in it. I look forward to a resurgent AMD. Will I be buying a TR? As much as I'd love the bragging rights, no. You do know Intel spent around $13 billion on R&D in 2017 alone, right? I maybe mistaken but i think that's possibly more than AMD's entire revenue during the same period.